Spring Hockey is back for 2019 at the Webster Ice Arena. No fee increases this year! 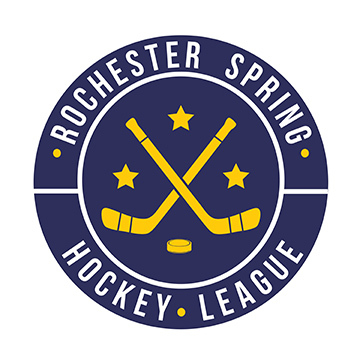 The Rochester Spring Hockey League is designed as a FUN and affordable way to continue your hockey season. The RSHL starts in late March and ends before Memorial Day, just in time for kids to get outside for Spring sports and activities. There are no conflicts with school vacations! Youth levels are designed for players to have maximum fun without the pressures of the regular hockey season. All games will be played at the Webster Ice Arena: Rochester’s premier hockey rink. Games are no-check with penalty’s resulting in a penalty shot. Teams will consist of small rosters so that everyone gets plenty of ice time. Whether you played house or travel level hockey, our program accommodates all skill levels. Divisions include: RWB/Mites, Squirts, Peewees, Bantams. For Midgets, we also offer a High School/Junior level in which games are played in a 3 on 3 format, plus a goalie. Squirts, PeeWees, Bantams, - Birth Years 2004 through 2010. There is no Midget division this year. Midget age players are encouraged to consider our 3-on-3 program. Modified rules to keep the action going: Tag-up offsides, no puck out-of-bounds stoppages, all minor penalties result in a penalty shot! We build small rosters so everyone gets more ice time! Evaluations on Saturday, March 30. Practice Sessions on Saturday April 6. A Second option for evals has been added on March 23! Teams will play three games per week. First games are Saturday, April 27. Finals for all divisions on Tuesday, May 21. No games during April School Break. Team-based pricing and registration. We will prorate teams with more than 6 skaters. Modified rules to keep the action going: No Checking, all minor penalties result in a penalty shot! 11 guaranteed games plus possible finals.